Controllable-pitch propellers have been developed and produced on the Baltic coast of Germany since 1962 – initially in Rostock, and then in Wismar from 1964. The first units were manufactured for 86 freezer-trawlers of type Tropik for the Soviet Union. Four further types were produced for GDR fishery vessels. The first years of controllable-pitch propeller production in Wismar centered on systems with a power rating of 1,930 kW for 199 freezer-trawlers of type Atlantik. A total of 230 controllable-pitch propeller systems were delivered up to the end of 1969. Over the years, the location evolved into a center of excellence tasked with planning and designing all propellers for shipbuilding in the GDR, as well as carrying out research in the field of propeller and fluid dynamics. From 1970, controllable-pitch propeller systems of the second generation were implemented, with simplified kinematics and a significant reduction in the number of parts. 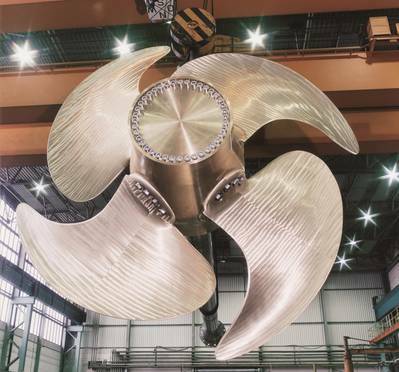 A total of 195 vessels of the type Atlantik Supertrawler were fitted with this propeller (2,850 kW, 3.4 m diameter). In 1975, systems with an input power of 8,250 kW (5.3 m diameter) were manufactured for bulk carriers, and later also for Multi-Bulk Container freighters, for delivery to the Federal Republic of Germany. Later additions to the production range were controllable-pitch propeller systems for trailer vessels, ferries and large freighters with constant-speed operation for shaft generators. In 1995, the most powerful controllable-pitch propeller system ever manufactured to date, with 15,000 kW and a diameter of 5.2 m, was supplied for a passenger-carrying container ship. In 1999, Schottel acquired the then WPM Wismarer Propeller- und Maschinenbau GmbH and has since built on the existing expertise in the development of controllable-pitch propellers. Major new impulses came from the new parent company in western Germany. A state-of-the-art manufacturing facility with highly qualified, flexible employees has been built up. The company’s portfolio now includes controllable-pitch propeller systems of up to 30 MW. They are used wherever utmost requirements in terms of variable modes of application and high maneuverability have to be met, from conventional freighters to fast ferries and powerful tugs, and can even be implemented for continuous operation under extreme loads in demanding offshore service with dynamic positioning. In 2012, five-bladed controllable-pitch propellers for fast vessels were brought onto the market. These are designed for applications with requirements for a lightweight construction in combination with high power ratings, e.g. for military vessels or yachts. They are based on the proven design principles of the standard systems but offer an even higher power density and a weight reduced by up to 15% while retaining the accustomed reliability and robustness. The propellers have been optimized in accordance with the latest state of the art in hydrodynamics and structural mechanics and are characterized by improved efficiency, reduced pressure pulses and structurally optimized hubs. At the same time, the simple and maintenance-friendly design and functional principle of the classic Schottel CP propeller systems have been retained. Schottel SCP controllable-pitch propeller systems of the 5-X series are available with power ratings from 1,000-20,000 kW. For all sizes there is an optional version with feathering capability. This makes it possible to satisfy the requirements of different operational states in the case of multi-shaft systems and combined propulsion concepts such as a CP propeller in combination with an SCD. The Schottel Group, with its headquarters in Spay/Rhine, is one of the world’s leading manufacturers of propulsion and steering systems for ships and offshore applications. Founded in 1921, the company has been developing and manufacturing azimuth propulsion and maneuvering systems, complete propulsion systems with power ratings of up to 30 MW, and steering systems for vessels of all sizes and types, for about 60 years. Around 100 sales and service locations worldwide ensure customer proximity.